Before checking out this post you might want to familiarize yourself with the project history and the site background & if you want to know more about Çatalhöyük research, you can find site reports from the current excavations here. 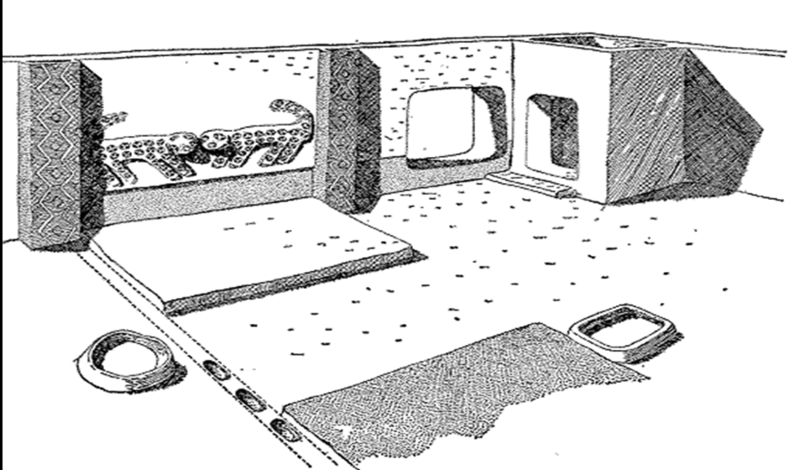 In part three, the history and politics of Çatalhöyük was introduced, specifically in relation to its discovery by James Mellaart in 1958, where it was mentioned that upon discovery of the site a series of decorated rooms and spaces were uncovered spanning the sites occupation and much of the material found at the site during these initial excavations was compiled and documented into a handful of reports that were used to influence the reconstructions of the level V hunting shrine (F.V.I). Crucially, when examining these reports, it should be understood that they are written and endorsed by the particular subjectivity of Mellaart and as highlighted previously, classifications of structures and buildings from the site have drastically changed in the years since he first explored the archaeology. Unfortunately, whilst is was impossible to evaluate the record from the early excavations first hand, there is a lot of material in the original reports that could be analysed to aid with the construction of a digital model, such as broad patterns that can be recognised from the site. Whilst behaviour from the site changes through time and not every ‘fashion’ was relevant, many recurring traditions at Çatalhöyük, such as the destruction of plastered reliefs before the infilling of a structure, or the burning of houses, although not directly related to the digital model, are an example of social habit and trends that justify using other shrines, that share repeating features and are close in date, as cross references to F.V.I (The Shrine of the Hunters). When viewing his findings from the site (see images below), it is clear to see that there are distinct patterns. The ladder entrances to the rooms are located on the south wall and in many instances the main paintings, sculpture and focus is orientated towards, or involves the north wall. There are also suggestions of refitted structures over different phases and periods, that again reference the contemporary interpretations put forward by Hodder (2007) of recurring spaces of importance. It is obvious to say that decisions were made at every point in creation of the model and whilst the archaeological components have their basis in the material record, how the model is translated through cameras, renderers and presented to an audience is an expressive and subjective process. Just as the architecture at Çatalhöyük betrays the “social, cultural and political settings, boundaries and events within buildings and the life-histories of the individuals, households and communities” (Matthews 2009: 150), associated with it, any digital representation created is time stamped by a variety of factors including the underlying theoretical, social and stylistic influences of its creator. Crucially the greater the artist/archaeologists grasp of the software, the more freely these influences can emerge and consequently, it can be noted that the shrines detailed above all highlight the style with which Mellaart desired them to be presented. They therefore represent very different visual objectives to what was desired to be achieved through a reconstructed model and specifically, the images above betray a sense of perfection and neutrality in their depiction, they seem cold, clinical and lifeless. In reality, taking the reverence that Mellaart attributes to these buildings and augmenting it with the idea of a domestic household required the promotion of the ideals of empathy, familiarity and comfort, through imagery. This was a presentation style that contradicted with Mellaart’s interpretations, who did not seem to attribute much humanistic value to these spaces and instead idealised and mystified them. If it is accepted that, “no pictorial device can be a transparent illustration of the world, but instead deploys technical devices, formal conventions, and ideological assumptions to orchestrate meaning” (Moser and Smiles 2005: 1), addressing these differences early in the development process was necessary to ensure that any representation was approached with the correct mind-set in order to represent the most contemporary theories from the research, to bring warmth, emotion and domestication to these spaces.